The novel “Far-Seer” by Robert J. Sawyer was published for the first time in 1992. It’s the first of the Quintaglio Ascension trilogy. It won the Homer Award as best novel of the year. Afsan is an apprentice of the Imperial Court astrologer Tak-Saleed. He has reached the age appropriate to go through the coming-of-age rituals, participating in a hunt and a pilgrimage. He remains hurt during the hunt but his contribution to the killing of a big animal brings him honors. On the ship carrying him on a pilgrimage, Afsan has the opportunity to talk to Captain Var-Keenir, who uses a far-seer, a new invention that allows him to see far away objects. His master refused to use that instrument but Afsan is too curious and asks the captain to lend him the instrument. His observations lead him to study the motion of celestial bodies but his conclusions go against religious precepts. In 1987, Robert J. Sawyer published the short story “Uphill Climb”, where he introduced the Quintaglios, intelligent dinosaurs descendants of tyrannosurids moved to another planet along with other dinosaur species before the mass extinction that wiped them out on Earth. In “Far-Seer”, nothing is said about who and how carried these dinosaurs to their new world and from what is told in the novel they assume that they were created there. Through many details in the story, Robert J. Sawyer provides information on Quintaglios’ society, their technological level, and their religion. Parallels between the Quintaglios and Renaissance Europe are transparent. The characters’ actions and motivations are easily understandable because their origin is in the same emotions human beings feel, a plausible idea. Robert J. Sawyer adds some peculiarities of their species linked to the fact that they are after all tyrannosaurids, descendants of fierce hunters. The protagonist of “Far-Seer” is Afsan, a young Quintaglio who is learning the art of astrology. Robert J. Sawyer uses his story to explain many sides of Quintaglios’ society by putting them into events, avoiding heavy infodumps. In my opinion, the author does it very well, keeping the story flowing at a fast pace. Passing through the traditional coming-of-age rituals give Afsan the chance to reflect on his future but especially during his pilgrimage to question his beliefs. Again there’s an obvious parallelism, specifically with Galileo, since Afsan gets convinced that Quintaglios’ cosmogony is wrong and proposes an astronomical system based on observations, getting in trouble with priests. After discovering the truth about his world and his solar system’s various planets and moons, Afsan must decide whether to take a stand to affirm and defend it, knowing that he’ll face serious risks. His decision also has other consequences because the events force him to reflect on various aspects of Quintaglios’ society, beginning with its power structures. In his novels, Robert J. Sawyer focuses on very few themes to fully develop them. In “Far-Seer” this is made more complex by the need to build a society of a non-human species and in my opinion the result is very good. The allegory has enough similarities to Europe’s history from a few centuries ago to allow the reader to easily understand the Quintaglios but there are still many references to their specific characteristics that remind us of the fact that they’re T.rex’s relatives. Themes such as the sciences opposed to religious dogmas and rationality opposed to irrationality are crucial today as well, indeed in the years since the first publication of “Far-Seer” these clashes seem to have increased. In my opinion Robert J. Sawyer develops them well within a story that I found engaging with well-developed characters. In Robert J. Sawyer’s allegory, religious dogmas and irrationality ultimately lead to total destruction. 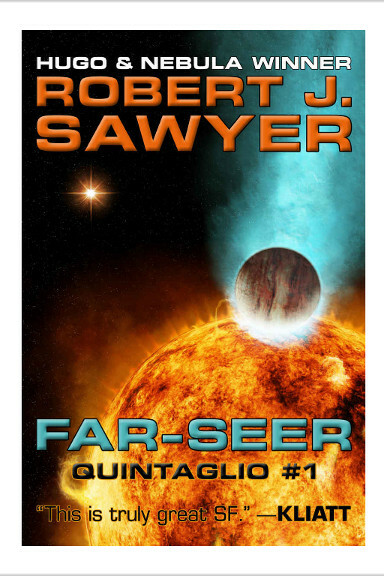 In “Far-Seer” this danger is shown but the actual developments in Quintaglios’ society continue in the trilogy’s other novels. Howerver, the first novel has an ending so you can read it then decide if you want to continue with its sequels. I recommend reading it.